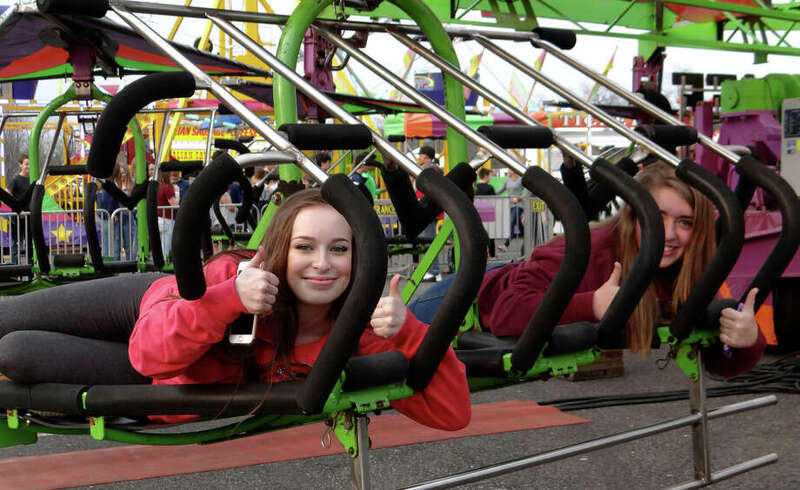 Fairfielders Sally Binswanger, 15, and Bella Phillips, 14, give a thumbs-up from the Cliff Hanger ride at the McKinley School PTA Carnival at Jennings Beach. FAIRFIELD — It was a warm spring night on Fairfield’s shoreline Friday as a local seasonal traditional launched with waves of fun. The annual springtime carnival sponsored by the McKinley School PTA opened its weekend-long run at Jennings Beach with an array of rides, games and refreshments. Among the popular attractions were amusement rides like Rip Cord, Cliff Hanger, Tornado, Ferris wheel, Scrambler Cobra and Super Slide, provided by Stewart Amusements. Games of skill and chance challenged attendees, while there were plenty of foods to appeal to all kinds of appetites, like funnel cakes, sausage and peppers, giant pretzels, fried dough and hot dogs. The McKinley PTA Carnival — proceeds benefit PTA programs at the school — continues at Jennings Beach on Sunday from 1 to 5 p.m. Daily $25 wristbands are available for unlimited rides.